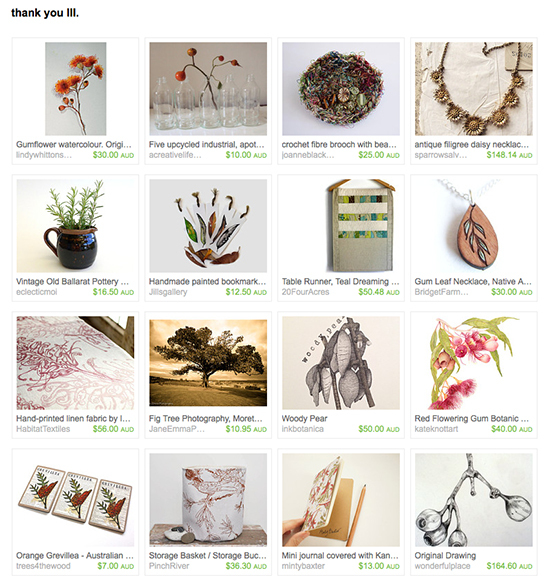 Thanks to greylittlemouse of Etsy shop Toys and Home Decor for including my 'wattle bird in the bottle brush' eco-fabric storage basket in her beautiful botanic-inspired Thank You III Treasury! There are some really beautiful pieces in there and I, myself, had already purchased Kate Knott's Red Flowering Gum Botanic Art Print as a gift for a friend earlier this year... it's simply gorgeous. Text and images Copyright © Gabriella Tagliapietra / Pinch River. You are welcome to post content from my blog as long as you provide full credit and link to my blog.